But one thing is for sure, Hero Honda knows the very pulse of the Indian mass, which is a commuter. 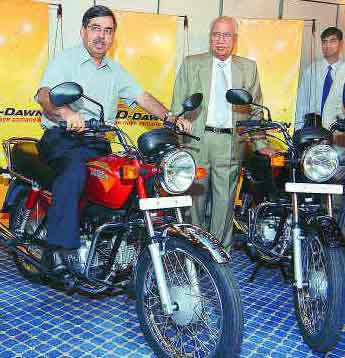 Reining the position of the largest bike manufacturer of the world for 8 years on the trot, the company has registered a 12% sales growth to 33 lakh units in the first 11 months of the fiscal year, when it's other close competitors like Bajaj and TVS are registering negative growth. This goes to show the immense and invincible commuter base the company has. Commenting on the figures achieved, company's MD Mr. Pawan Munjal said - “We make products that customer wants and that is driving sales.”. At a time when other companies are focusing more on the performance segment and fighting a tough battle to keep the ship afloat, Hero Honda is sitting up there comfortable and unperturbed cruising happily on the back of it's huge 100cc base. I like their bike stable or don't like it, but all kudos to Hero Honda for the achievement. Yep, even if some people don't like them... they surely can't Ignore them. even today also a very vast majority of people (generally in the age group near to 35 and above) who still swear by Hero Honda.... and I guess that's the prime customer base for Hero Honda....! !